I played kickball yesterday, you guys. Like, kick-a-ball-around-on-a-field with teams and running and everything. I haven’t played kickball since high school, and I’ll tell you why: I am the least athletically coordinated person on the planet. Sports + Stephanie = not such a great pair. I’ve tried, oh, I’ve tried. And the closest I ever got was being on the winning team for badminton in high school (but I totally rocked that racquet). I’m also pretty good at aerobics, though I’m fairly certain it’s impossible to be bad at aerobics (actually, I take that back. I have seen my darling husband try to do aerobics and it’s not pretty). Anywho, so kickball. I did that yesterday. And it actually wasn’t as much of the Spectacular Horrorfest of Embarrassment I’d expected it to be; in fact, it was kind of fun. All that to say, however, that my kitchen and I? Yeah… we’re a much better pair. If there is anything I love more than yogurt, it’s when I toss something into my yogurt. Berries? You betcha. Nuts and granola? Oh hey, welcome. Granny Smith apple and ginger compote? Oddly specific, but yes, you can join the party. 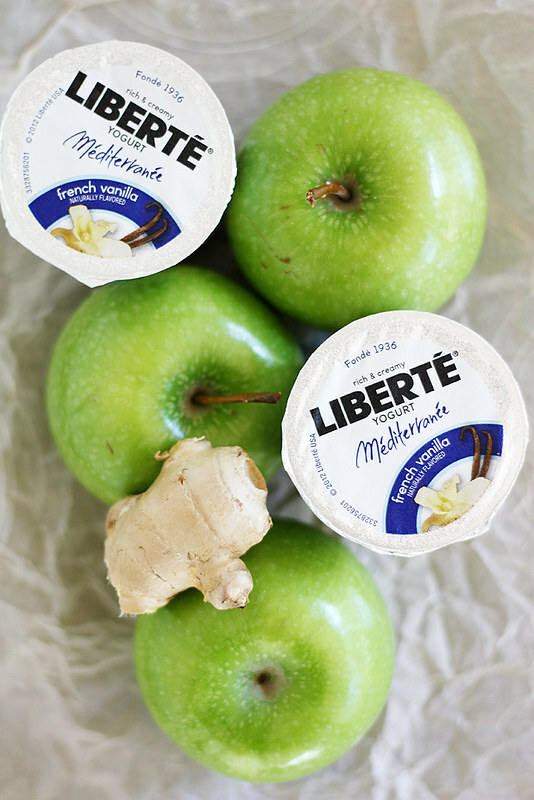 When Liberté Yogurt asked me to come up with another Perfect Pairing for fall, I immediately jumped into full fall inspiration mode and came out with this combination: apple-ginger compote with walnuts and Liberté Méditerranée French Vanilla yogurt. Fancy and snobby, it is not. Decadent and flavorful, it most definitely is. But this isn’t your typical morning breakfast yogurt, oh no. It’s the kind of yogurt you enjoy when you want something delicious, indulgent, bold, simple and sophisticated. The kind of thing that you can get lost in for a moment, cozy up with after a long day, or that helps you recuperate from a game of kickball on a Sunday afternoon (seriously, my 26-year-old legs do not move with the agility my 16-year-old legs did, that is fact). The compote could not be easier to make, either. 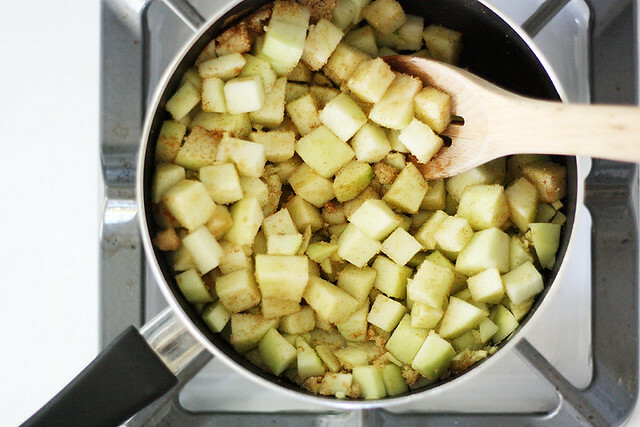 Just toss some cubed apples with fresh ginger, sugar, spices and a touch of lemon juice and let the whole thing simmer on the stovetop for a few minutes until it softens and comes together. I suggest serving it on top of the yogurt while it’s still warm, so you get that cool-hot sensation that makes apple crisp a la mode so amazing. A sprinkle of walnuts on top adds extra texture, too, if that’s your thing. I know it’s definitely my thing. Apples and ginger and walnuts and French vanilla yogurt? I have a feeling we’ll be seeing a lot of each other this fall. Combine chopped apples, ginger, brown sugar, cinnamon, nutmeg, salt and lemon juice in a medium saucepan over medium heat; cover. 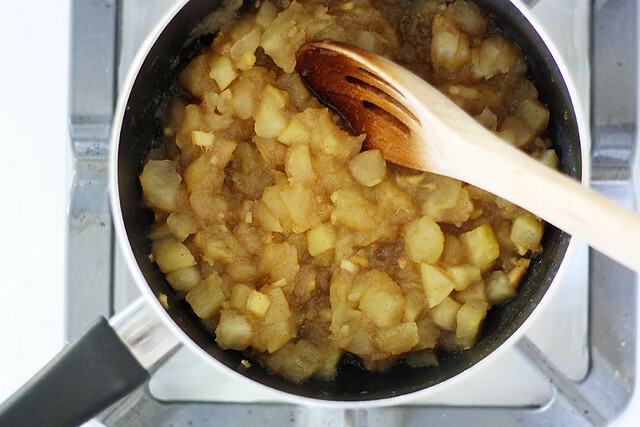 Simmer 10 minutes, stirring occasionally, until apples are soft and mixture is thickened. Spoon yogurt into serving bowls. Top with spoonfuls of warm compote. Sprinkle with chopped walnuts, if desired. Disclosure: I received compensation from Liberté Yogurt for recipe development purposes. All opinions are my own. Walnuts are such an underused and (often abused) nut. Sometimes it can turn too bitter. I love apples and ginger. It is like the combo of pears and ginger but I think better! How healthy does this look and that yoghurt is so creamy! Haha, I have not played kickball since like second grade! Sound fun though! 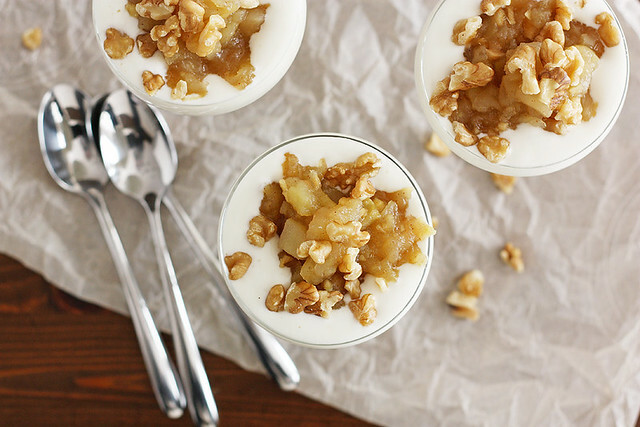 Love this yogurt and especial the granny smith apple and ginger compote! That sounds incredible! Belinda — I agree! Gotta love and care for the walnut underdog 🙂 Thanks, friend! Tieghan — Haha, right?? So random, but actually kind of fun. 🙂 Thanks, friend! You and I sound EXACTLY alike when it comes to sports. And my school had a charity kickball tournament this summer… all I will say is YIKES. Now this compote does sound right up my alley! I love the flavors! Despite being terribly uncoordinated, I loooooved kickball!! You totally know how to start a Monday morning right….loving this breakfast situation! I think I lumped kickball in with dodgeball in my mind and that was a terrible memory so yeah, not my cup o tea either. This lovely dessert/breakfast is exactly my cup. Love apples and ginger! It’s been YEARS since I’ve played kickball! I’ve always enjoyed playing sports, but I’m not so great at them too…I’m always afraid of getting a ball kicked in my face. Your apple ginger compote looks amazing! I bet it’s amazing on vanilla yogurt! Or ice cream or pancakes…or apple pie 😉 Hope you had a great weekend, lady! This looks like heaven in a glass! I love trying out new toppings on my yogurt and this apple ginger combo sounds out-of-this-world-good. Yum. Marie — Haha, yikes indeed 🙂 Thanks, darlin’! Kelli — Haha, I actually didn’t hate it too much, either! Must be an easy sport for the uncoordinated. 🙂 Thanks, friend! Maria — Ugh, dodgeball. Horrible memories. Let’s focus more on this yogurt situation. 🙂 Thanks, dear! Julia — Right? The ball-kicked-in-face fear is huge for me. 🙂 And YES — this would be magical on ice cream, pie and/or pancakes. Thanks, love! Consuelo — Wish I could send you some in time for breakfast tomorrow — it really is a yummy way to start the day 🙂 Happy Monday to you, too, dear! So pretty, I love the idea of topping my yogurt with compote (I’d also like to use it on pancakes!). girl, did you know i was a kickball coach for 2 years?? you go kick that ball! haha – you can do it! ok, i’ll stop 😉 this creation you’ve got here looks heavenly and i want a huge bowl or glass of it!! Dude, I totally used to play on a kickball team. It was a blast!! Let’s play kickball together and then eat this delicious dessert! Ugh, sports. Ugh, anything requiring coordination. Things I am not bad at: yoga and the cooking/baking. That pretty much sums up high school PE for ya. I want to spoon this compote over everything, not least of which is a spoon straight to my mouth. Ha Kickball..I haven’t played that in years. This looks sooo good..I want to slather it on some waffles or pancakes or both,. Julie — Lol, for real?? That. Is. Awesome. Stephie — Ah, yes. Yoga was a strong(er) point for me, too (well, minus the flexibility part, oy). We Stephs are much better suited for the kitchen! Erika — That sounds like a genius plan. Beautiful photos! Looks so wonderfully vibrant and tasty! Oh god kickball.. I used to hate when we had to play during gym class (especially when indoors). I remember this one time where a kickball hit me square in the face. Ouch! Good to hear this last adventure with kickball ended well! These are so pretty! And faaaaaancy! I love them!! Beth — Thank you so much! Ashley — Thank you, darlin’! I LOVED kickball in elementary school, but I would hate to know how bad I am at it these days, ha! The compote looks wonderful and Liberte is amazing yogurt. I bought the coconut Liberte on a whim one day and it was insanely delicious. Nicole — Haha, yeah, waking up two days after playing and STILL being sore told me a thing or two. 🙂 And the coconut Liberte is the best! Though this French vanilla one is a close second for me. Even though I run I have negligible other athletic ability. Anything that requires hand-eye or foot-eye coordination, for instance, is a no go. So I feel you. But I could maybe get into a game of kickball with the promise of this parfait at the end. And by maybe, I mean I would do anything to have this in my life right now. Mmm this compote is soooooo perfect for fall. It looks so fancy and pretty! I am so sure your kickballing wasn’t half as bad as you describe it. Joanne — Ugh, I can’t even run, so you’ve got one up on me for that. 😉 I think we both deserve parfaits for the effort, though. Stefanie — Haha, it wasn’t the worst, but I can’t say I’m going pro any time soon! 😉 Thanks, dear! Yummy! Sometimes, I like to fry up some diced apples, butter and sugar to put on top of my oatmeal or yogurt — this has inspired me to add some ginger to the mix! Thanks for sharing! Totally with you on the anything-in-yogurt bandwagon. 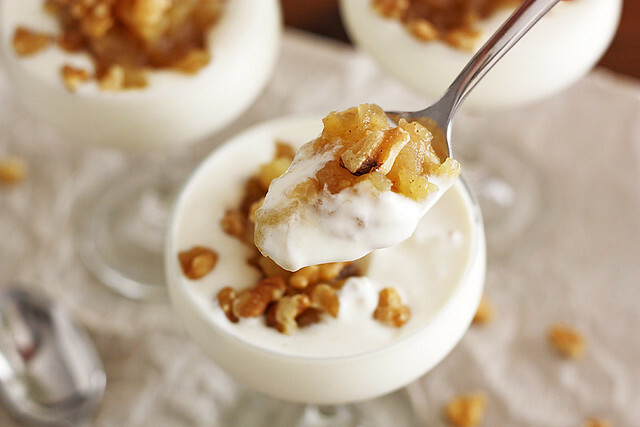 Love the addition of walnuts to this sweet/tangy compote aaaaand I think all of these things are in my house right now…so I think I’ll be making this before the week ends. Also. One time, a year ago, I played softball and sprinted to first like MY 16-year-old legs knew to, and I was literally tight and sore for like a week afterwards. Getting old is the worst. 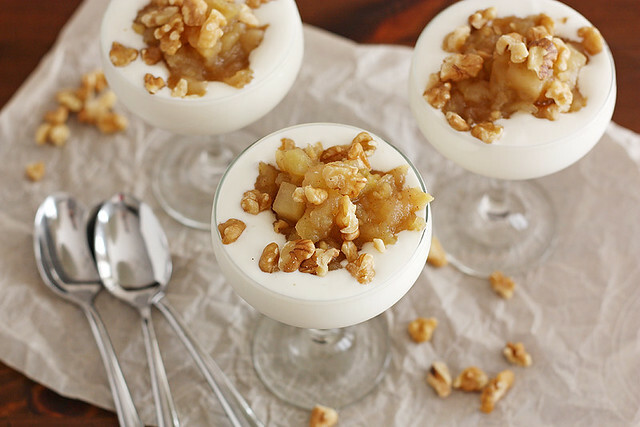 Topping yogurt with this apple compote is a splendid idea! I wish I had fresh ginger. Any thoughts on how dry ginger would work within the recipe as a substitute? Thank you so much! Leaf — You definitely can use dry ginger in place of the fresh ginger. Just use about 1 teaspoon dry ginger to replace the 2 tablespoons fresh. Enjoy!